The 2008 NBA Draft is coming up in 6 days and the Chicago Bulls have to decide who to choose with their number one pick. One choice is hometown boy Derrick Rose from Memphis who has begged with the Bulls over the last few days to choose him and allow him to play close to home. The other choice is Michael Beasley from Kansas State who is an exceptional rebounder and great big man. The Bulls have not tilted their hand one way or the other as Beasley worked out for the team on Wednesday while Rose worked out on Thursday. Yet, those workouts have not seemed to clarify anything as Bulls’ GM John Paxson said that both had excellent workouts. With the Bulls not giving any inclination to whom they will choose number one, it is up to us to sort through statistics and team needs to choose who the best choice is for Paxson and Chicago. Beasley put up phenomenal numbers at Kansas State, averaging 26.2 points and 12.4 rebounds per game while shooting 53.2% from the field. Though Rose’s stats are not as impressive (14.9 ppg, 4.5 rpg, 4.7 apg), many people have questioned Beasley’s character as he had a couple of off the court incidents duringhigh school. 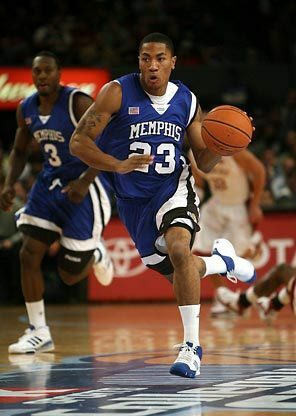 While I watched Beasley and Rose play at college, it was clear who was the more talented player: Beasley. However, Rose is a true point guard and the Bulls are in need of a true passer. They have Ben Gordon, but he is more of a shooting guard and drafting Rose will allow Chicago to move Gordon to a more comfortable position for him. With Luol Deng at small forward and Drew Gooden at power forward, the Bulls may be in greater need of a point guard than a big man. That’s not to say that Beasley would not help the Bulls. Selecting Beasley would improve Chicago immensely, but the concern over Beasley’s character, Rose’s deep desire not just to play at home, but to win at home, and the Bulls’ need for a true point guard lead me to believe that come Thursday, David Stern will be announcing Derrick Rose as the number one pick in the 2008 NBA Draft. There you go. I took a shot at the Top 15 and I’m sure there will be plenty of trades and surprises which will make this list look like Phil Mickelson at the US Open on the 13th hole (he quadruple bogeyed it).